Dogs can also understand more than 150 words and intentionally deceive other dogs and people to get treats, according to psychologist and leading canine researcher Stanley Coren, PhD, of the University of British Columbia. He spoke Saturday on the topic “How Dogs Think” at the American Psychological Association’s 117th Annual Convention. Coren, author of more than a half-dozen popular books on dogs and dog behavior, has reviewed numerous studies to conclude that dogs have the ability to solve complex problems and are more like humans and other higher primates than previously thought. “We all want insight into how our furry companions think, and we want to understand the silly, quirky and apparently irrational behaviors [that] Lassie or Rover demonstrate,” Coren said in an interview. “Their stunning flashes of brilliance and creativity are reminders that they may not be Einsteins but are sure closer to humans than we thought.” According to several behavioral measures, Coren says dogs’ mental abilities are close to a human child age 2 to 2.5 years. The intelligence of various types of dogs does differ and the dog’s breed determines some of these differences, Coren says. “There are three types of dog intelligence: instinctive (what the dog is bred to do), adaptive (how well the dog learns from its environment to solve problems) and working and obedience (the equivalent of ‘school learning’).” Data from 208 dog obedience judges from the United States and Canada showed the differences in working and obedience intelligence of dog breeds, according to Coren. “Border collies are number one; poodles are second, followed by German shepherds. Fourth on the list is golden retrievers; fifth, dobermans; sixth, Shetland sheepdogs; and finally, Labrador retrievers,” said Coren. As for language, the average dog can learn 165 words, including signals, and the “super dogs” (those in the top 20 percent of dog intelligence) can learn 250 words, Coren says. 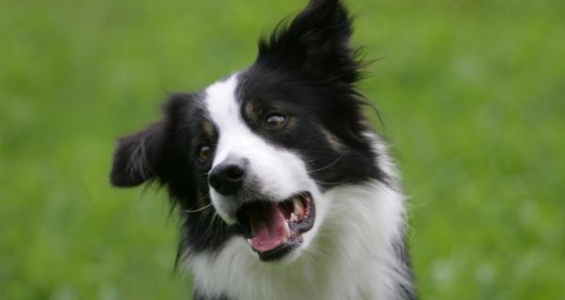 “The upper limit of dogs’ ability to learn language is partly based on a study of a border collie named Rico who showed knowledge of 200 spoken words and demonstrated ‘fast-track learning,’ which scientists believed to be found only in humans and language learning apes,” Coren said. Dogs can also count up to four or five, said Coren. And they have a basic understanding of arithmetic and will notice errors in simple computations, such as 1+1=1 or 1+1=3. Four studies he examined looked how dogs solve spatial problems by modeling human or other dogs’ behavior using a barrier type problem. Through observation, Coren said, dogs can learn the location of valued items (treats), better routes in the environment (the fastest way to a favorite chair), how to operate mechanisms (such as latches and simple machines) and the meaning of words and symbolic concepts (sometimes by simply listening to people speak and watching their actions).